Christie’s ties to Russia stretch back to the 18th century, when James Christie famously negotiated the sale of Sir Robert Walpole’s collection to Empress Catherine the Great. In 1934 Christie’s pioneered the Fabergé market with the first dedicated sale at our King Street premises, and Russian art has been a regular feature in Christie’s auction rooms ever since. 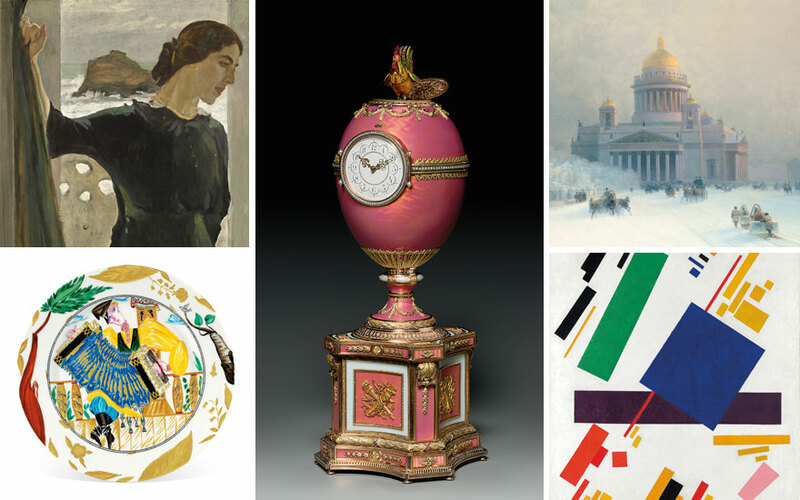 In 1969 the first dedicated Russian Art department was established in Geneva, and landmark sales of Fabergé eggs and Soviet porcelain swiftly followed. Christie’s has a long pedigree in handling the most prestigious private collections of Russian Works of Art in the field: Clore, Forbes, Greenfield, Kazan, Provatoroff, and more recently Somov, HRH The Princess Margaret and King George I of the Hellenes. We currently hold the record for the highest price ever paid for a Russian painting at public auction — Kazimir Malevich’s Suprematist Composition, which sold for $85,812,500 in 2018 — and the most expensive Russian work of art in the category — the Rothschild Fabergé Egg, which realised £8,980,500 in 2007. Christie’s long-standing professional relationships with institutions worldwide has led to us being entrusted with the sale of Russian art from the Brooklyn Museum, the Metropolitan Museum of Art and the Frances Lehman Loeb Art Center-Vassar College, New York. In 1990, Orest Kiprensky’s Portrait of Prince Evgenii Gagarin was purchased by the State Russian Museum in St Petersburg, marking the first sale to a Russian institution following the break-up of the Soviet Union. The department holds more than 50 international records for Russian paintings, and has set auction records for some of the biggest names in Russian art history, including Ilya Repin, Isaak Levitan and Vasily Vereshchagin, and avant-garde masters including Natalia Goncharova, Ilya Mashkov and Aristarkh Lentulov. Our Russian Art team boasts over 100 years of combined experience, with specialists based in London, New York and Paris. Dedicated sales are held twice a year in London (June and November), and as the market for Russian Art continues to develop, Christie’s will continue to present outstanding pieces such as the landmark offerings listed below. Kazimir Malevich’s iconic Suprematist Composition, painted in 1916, is the most important work from the artist’s revolutionary ‘Suprematist’ series ever to appear at auction. In the early 20th century audiences were shocked by Malevich’s abstract, geometrical compositions, which marked territory entirely uncharted by any previous artist. More than 100 years later, this assemblage of simple, coloured forms against a white background, a work so dynamic that the shapes hover as if caught in motion, captured the attention of the international art market once more. When the hammer came down on Suprematist Composition at a staggering $85,812,500, it set a new world auction record for a Russian painting. Later that year, Christie’s London sold Malevich’s Landscape (1911) for £7,883,750, establishing another world auction record for a Russian work on paper. The Yellow Sultana was executed at the height of Léon Bakst’s creative collaboration with Serge Diaghilev and his Ballets Russes. It reveals a world of passionate fantasy beyond the artist’s familiar designs for the theatre and his comparatively restrained academic studies of the female form. In this watercolour the Sultana reclines seductively, confidently occupying the space and gazing provocatively into the imagined wings of the painting. The sensuality of the form is enhanced with colours that fizz with eroticism and the vogue for Orientalism that had captured society at the time. When it was offered at Christie’s London in 2012, The Yellow Sultana made a similar impact on the art world, setting a new world record for the artist. In 1916 Natalia Goncharova, the archetypal ‘Amazon of the Avant Garde’, made her first trip to Spain to join Serge Diaghilev and his Ballets Russes. Goncharova was enchanted by the country’s energy, culture and visual delights, finding parallels between flamenco dancers clad in floral patterns and the native folk art of her homeland. Such inspiration is clear in Espagnole (c. 1916), where the triangular Cubist forms divide the flash of white lace of the mantilla from the ochre wooden comb and pleated fan. When it appeared at auction in London in 2010, Espagnole not only set a record price for Goncharova, but, remarkably, also established a new auction record for an international female artist. It was a record that remained unbroken for three years. In 1902, the St Petersburg jeweller Peter Carl Fabergé was commissioned by Béatrice Ephrussi de Rothschild (1864-1934) to create an Easter egg as a gift for her brother’s new fiancée, Germaine Halphen (1884-1975). A creative tour-de-force, the resulting pink enamel egg is adorned with seed pearls and gold wreaths and swags, and breaks open on the hour to reveal a diamond-studded cockerel with articulated wings. Previously unknown to the public and the academic community, The Rothschild Egg created a sensation in 2007 when it achieved three records at auction: the highest auction price for a Russian work of art, for a Fabergé item and for a timepiece. Christie’s was the first auction house to offer an Imperial Fabergé Egg when it sold The Hen Egg in 1934. Since then it has sold a total of nine large Fabergé Eggs at auction — more than any other auction house — including the magnificent Winter Egg (sold twice, in 1994 and 2002). The Rainbow was the jewel in the crown of The Somov Collection, which sold at Christie’s London in 2007. More than 100 oil paintings, watercolours and drawings were included in the sale, none of which had ever previously appeared at auction, and many of which had not been reproduced or exhibited. This work had formerly been owned by Somov’s muse, Boris Snejkovsky (1910-1978). In The Rainbow Somov dazzlingly captures the ethereal qualities of sunlight, the rainbow itself symbolising nature’s ephemerality. The painting soared past its pre-sale estimate of £400,000-600,000 before selling for £3,716,000, setting a new world record for the artist. Valentin Serov, arguably the defining artist of Russia’s Silver Age, was renowned for portraits that captured the spontaneity and nobility of his subjects. This exquisite portrait of his collector friend Maria Zetlin (1882-1976), the doyenne of Russian émigré life in Paris, showcases how prodigiously gifted he was. Face turned away from the viewer, she appears lost in thought — detached, enigmatic and powerful. Sold by the Municipality of Ramat Gan in Israel to benefit its museums, Portrait of Maria Zetlin became the most expensive painting ever sold in a Russian Art sale when it raced past its pre-sale estimate of £1,500,000-2,500,000, finally selling for £9,266,500 in 2014. Ivan Aivazovsky’s St Isaac’s on a Frosty Day displays the St Petersburg landmark in its full glory. Famed for his paintings of mariners at the mercy of the elements, Aivazovsky had a unique ability to capture the wild and unpredictable movements of the sea. In St Isaac’s on a Frosty Day, Aivazovsky masters the subtleties of light. It is a skill that sets him apart from his contemporaries and explains why he remains one of the most sought-after and enduring artists in the category. While the painting is an atypical work by Aivazovsky, its sale will always be remembered as a turning point in the market. This image of a tranquil snow-covered landscape, striped with troika tracks, became the first picture to break the £1,000,000 barrier in a Russian Art sale, realising £1,125,250 in 2004. This exquisite porcelain plate showcases the vibrant colours and joyous subject matter — the accordion player is synonymous with traditional Russian folklore — that defined the work of Alexandra Shchekotikhina-Pototskaya. The artist’s disregard of perspective is a nod to the traditions of icon painting, while the exuberance of the composition marks it out as a masterpiece of Soviet porcelain. In 1988, Christie’s London sold ‘The Bellringer’, another design after Shchekotokhina-Pototskaya, for £20,900. Thirty years later, proof of the continued demand for exceptional Soviet porcelain came when ‘Accordion Player’ sold for £150,000, smashing its pre-sale estimate of £20,000-30,000. This unique, jewelled Fabergé imperial presentation snuff-box, executed by the workmaster Henrik Wigström, displays a portrait miniature of Tsar Nicholas II in the uniform of the 4th Imperial Family Rifle Guards. The portrait is surmounted by a rose-cut diamond crown placed above a laurel-leaf diamond wreath that, in turn, is enveloped in an intricate lattice of rose-cut diamonds. The Imperial Court was famed for its extravagant gifts of luxurious items to visiting foreign dignitaries. Snuff-boxes such as these were the most coveted of all imperial gifts, and this extraordinary item was the last box ever delivered by the Imperial Cabinet on behalf of Tsar Nicholas II on 5 May 1917, two months after his abdication in March. The snuff-box was brought to auction at Christie’s from the highly prestigious Forbes Fabergé Collection, which was expertly assembled by the entrepreneur Malcolm Forbes (1919-1990). The impressive and sensitive craftsmanship of this Fabergé carved hardstone model of a street painter achieves marvellous comic effect. Modeller Boris Fredman Cluzel adapts the proportions of the body to render the figure indisputably appealing. His baggy trousers and oversized boots strike an amusing contrast with the intricately laid lapis lazuli at the base of the bucket, the rhodonite rod over his right shoulder and his sapphire eyes. The figure follows the tradition of the Russian porcelain factories of the late 18th and 19th centuries, and is acclaimed in the memoirs of Franz Birbaum, head master of the Fabergé company, as one of ‘the most remarkable stone creations’ in existence.